4mm Speaker binding post terminals for loudspeaker chassis mount and wall plate outlets. 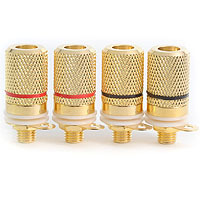 Speaker Binding Post Terminals - Heavy Duty Insulated 4mm Banana Sockets A premium quality speaker binding post, this gold plated heavy duty loudspeaker socket is supplied with isolation washers, making it suitable for fitting onto metal amplifier or wall panels. Internal solder tag. Item code: BINPOS04. 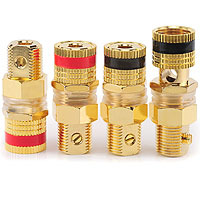 Screw Type Binding Post Connectors - 4mm Speaker & Wall Plate Sockets 4mm binding post supplied with isolation washers, making it suitable for metal wall plates. 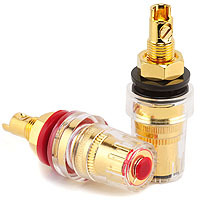 This gold plated speaker socket has a screw fit internal cable connection, making it the perfect choice for fitting on site. Item code: BINPOS02. 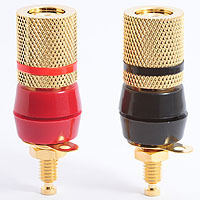 Gold Plated Speaker Binding Post - Solder Type 4mm Terminal Socket Gold plated loudspeaker socket supplied with isolation washers, making it suitable for fitting to metal panels. Accepts 4mm banana plugs, bare wire or spade terminals. Internal solder tag connection. Item code: BINPOS01.